Thanks for that. I really appreciate your comments about the Abu Seven. I’ve seen Mark Preston distance casting at the Rakaia River mouth and I agree with you that he is one of the best. I didn’t realize he had used an Abu Seven but I did know he fished a Tricast rod. I spoke to Paul Thomas last week about the reel. He said that the left-hand side is good but parts for the right-hand side, i.e. pinion and main gear are hard to find, as are the side plates. He also said that the spool control knobs can bind to the alloy bushing housings (see picture) so they become locked together meaning the spool control knobs can’t be used. Once stuck together turning the knob turns the housing as well making it almost impossible to remove or replace the brass bushings. Paul says this is not easy to fix. The problem is caused by lack of maintenance. Some anglers may have a reel for many years without ever adjusting the spool control knobs until eventually they seize up. 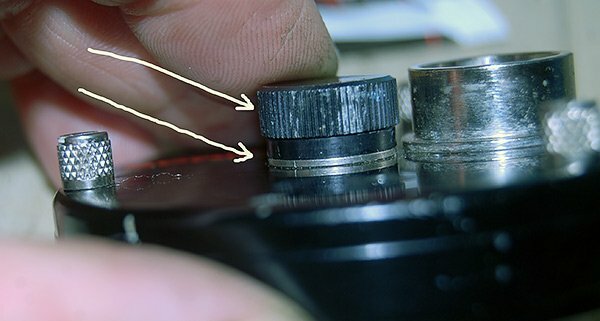 It is a good idea to periodically remove the knobs and coat the thread with a little grease to prevent them from binding solid. This applies to all models of Abu bait-casters.